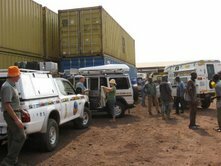 The Saharan Adventure has been delayed because of unavailability of a ship to transport the vehicles to Cameroun. Juno, one of our participants, has undertaken to tackle the loading of the vehicles into containers and this is proving to be a mammoth task. 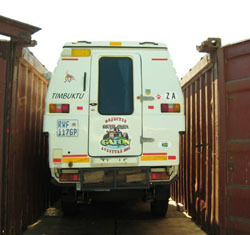 A problem arises when small containers cannot hold the high vehicles, namely the Landcruiser and the Sprinter. 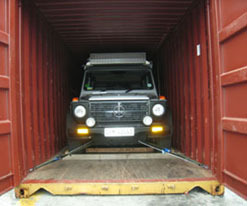 Max, the De Laendewagen and Pam's Landcruiser called The Camel share a 40 ft container and fit in perfectly. (They were originally in two smaller containers). Timbuktu is too high and has to be altered. Her wheels are removed and she stands on blocks. Then her solar panels are taken off. This is not an ideal way to be transported, but we have no choice. 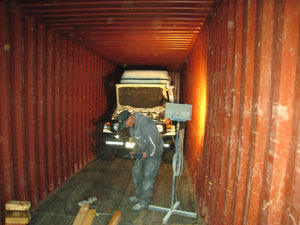 A stroke of luck - Juno finds a large open container for his Sprinter and Timbuktu. Her wheels are put back on and the two are loaded into their bigger container. They are tied down tightly ready for the voyage. 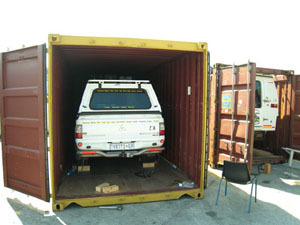 The vehicles are loaded and the ship will sail out of Cape Town on the 11 November. The ETA of the vessel in Cameroun is 3/4 December. 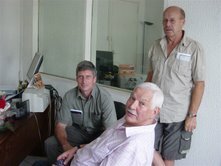 The group's airtickets and accommodation will be changed for our arrival in Cameroun on the 4 December 2007. Juno made the final arrangements for shipping in Capetown- not an easy task as he relates: "We only got the last container [High Volume] on Wednesday at 4pm, and with the Customs inspection and sealing at 10am on Thursday, we were forced to work until Midnight. Had a bit of a sweaty time with a real ‘Traffic Cop” type Customs Officer yesterday. He at one stage threatened impounding our shipment because our Carnet values did not in his opinion reflect the true export value of our vehicles. I had to employ a bit of nifty footwork and docile humbleness [not my usual style] and thankfully I finally won him over. His presence did however rush the lashing of my vehicle which I hope gets there ok. The containers have finally been dispatched…..they left my yard @ 2pm today, so now we await the ship’s departure on Sunday. The vessel is MSC Mara 12R and is operated by Mediterranean Shipping Co. The ETA in Douala at this stage is 3/4 December but I will have a better ETA on Wednesday when the Cargo Router will have more precise times for the Las Palmas/Douala sector. I suggest we await the air ticket changes until then." As you can see in the picture, the Mitsubishi Stallion behaves like a groomed beast and slinks into its container. Jurassic Jet is ready to load. The M S C container ship is loaded and somewhere on board are stacked two double and one single container holding our precious cargo - our vehicles. She sailed on Sunday 11 November 2007 and should reach Cameroun on 3/4 December 2007. 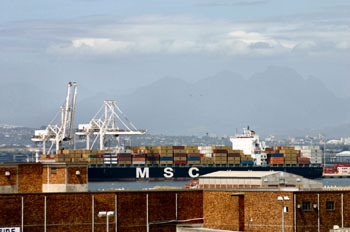 The vessel heads for Las Palmas now, where the vehicles are loaded onto another ship, which leaves finally for Douala. On leaving Las Palmas we will have a better idea of when we will need to arrive in Douala. A phone call from Juno in Cape Town this morning confirms that the ship has arrived in Las Palmas and our vehicles can now be transferred to the next ship destined for Cameroun. Right, this means we can now change our flights to Cameroun to the 4 December. We feel elated and dash off the Bellview Air to make the change for the group. Of course this will cost us R700.00 each to do the change. Bellview Air is in chaos .... the main consultant has resigned and we realise this is going to be one loooong event. Well, a three hour event to be truthful. First problem, the flight on the 4 December has been chartered - so no go. We settle for the 6 Dec (flights only leave on Tuesdays and Thursdays) and then my phone rings and it is Juno from Cape Town. 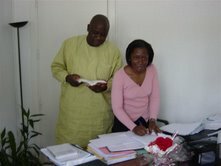 His contact has just confirmed that the ship will arrive in Cameroun on the 11 December ... and that is the final date. Whew, just in time, as the consultant Peter's index finger was just about to click "enter" on his computer to confirm the booking for the 6 December .... saved by the index, so to say. Finalisation at last ... well as far as finalisation goes in Africa, that is. The good news is that WE FLY OUT OF ORT (O.R. 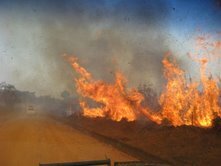 Tambo) on 11 December ..... come desert storms or camel dung ... to Cameroun and that is that. We will explore Douala and drink Cameroun beer .... but we are leaving on our North African trip. 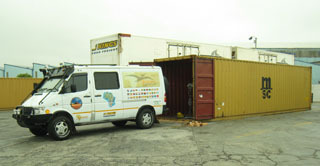 We have heard the good news that the ship carrying our vehicles will arrive in Douala, Cameroun on 14 December 2007. We have booked our flight with Bellview Air to leave South Africa tomorrow, 11 December. We are like children waiting for Father Christmas to arrive on Christmas day. Last minute packing begins; this involves packing the most important items for the trip like documents, money, electronic equipment and all necessities that we will need until the vehicles arrive. Lets hope the shippers will not let us down, but this is Africa. Of course, as the packed vehicles travelled to Cape Town in October for earlier shipment, it is a case of digging in the memory pot and trying to remember exactly what we did or did not pack. Marine insurance on the vehicles while on board the ship, as well as insurance on the vehicles for the duration of the trip, was confirmed. However we have learnt that hefty customs fees will have to be paid in Douala. Lets hope that we enjoy the pleasure of having a customs official who started his morning sipping an aromatic cup of coffee on the day that our vehicles are off loaded. On the 11 December, we will greet you all from Cameroun in North West Africa. We are all here safely. Flight was delayed by 3 hours but everyone waited calmly because we were just so glad to be on our way..
Impressions of Douala: Classed as the armpit of Africa it is living up to its name:::bussling, dirty but electric with friendly people ready to smile, city dripping with humidity... Catholic Mission Hotel was a one night stand...wooden dorm beds, basic basic table and each room with a shower built up 2 steps like a throne...one toliet per hallway completed the ambiance. Juno and Moon exited immediately causing Brother Dennis to run downstairs to send a prayer to God to bless him with patience to deal with South Africans. The rest of us stayed and had a tasty but simple dinner and woke to a lovely church choir service early this morning held on the first floor. Just as we were getting cozy, Brother Dennis delivered the news that his mission was fully booked so we decided reluctantly that we should join Juno and Moon at the Arcade Hotel which has turned out to be nice. Today was the BIG DAY to begin our assault on the Marine Shipping Agents to find out where the heck the vehicles are and how much we will have to pay to get them back. After spending 2 hours with the agent barginning and blustering we broke for lunch and the men headed back for round two with the agents. It sounds like the ship may be arriving tomorrow....and thats when some serious negotiation skills will need to be applied to settle on a reasonable release figure for each vehicle. Nothing is so simple in Africa! The news that the boat was arriving today was false. At 5:00PM we learned that the ship was only at a place called TIN TIN although no one can find that port on the map. It may be near Accra and we are spelling it wrong. 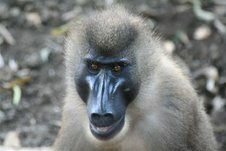 Who knows;;; We hear the ship will now arrive on Monday but will take a week of "negotiations".... Today we are trying to arrange a combi to take us to Limbe to see the Botanical Gardens and Wildlife Primate Centre and stay along the beach there. Much nicer than Douala and we need to see those places anyway. We will stay here tonight because Slowys wife, Leony, is arriving on the night flight to join us until January. She had been delayed from the first flight and we are all glad she is joining us, esp Slowy! In true African style, Leony's plane arrived in Douala nine hours late. 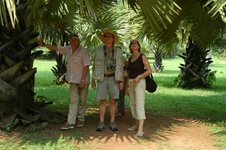 Meanwhile we had arranged a private tour, complete with driver and guide, to the beach town of Limbe. As we left the city, it seemed most of the residents of Douala were set up as roadside vendors selling everything from fresh produce, hunks of meat, hardware, car parts to fake Christmas trees. What a pleasure it was to get out into the green and hilly countryside. 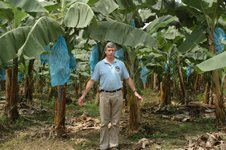 We stopped to examine the banana trees and rubber trees (Does anyone know why the trees are all tilted to the West?). We got excited when our guide told us we could stop at the tea plantations as we hoped to get a cuppa, but no luck ...only a look at the bushes. 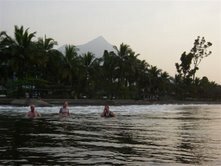 We felt like we got the best of Limbe hotels as we stayed at Seme Beach Hotel Friday night where we could swim in the warm sea and walk on dark brown volcanic sand of the Gulf of Guinea which was a highlight. 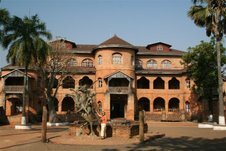 Saturday we stayed at Kie Village Hotel high on a hill with a view of Limbe town. With the locals, we ate grilled spicy fish, using our fingers, washed down with lots of local beer. 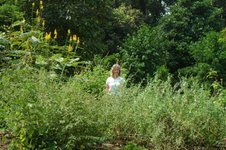 No visit to Limbe is complete without a trip to Limbe Wildlife Centre where we were impressed with the local efforts to save Cameronian endangered species such as the drill (a type of Ape). 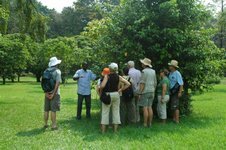 We also had a guided tour of the Limbe Botanical Garden where we learned about spicy, perfumed and indigeous trees and shrubs. NEWS FLASH ON THE VEHICLES We learned that Tin Tin was really Tin Cam, a port somewhere north of here...we think. We heard also that the vehicles were to arrive in Douala last night and would be released on Wednesday once we had paid our ransom of 1000 euros per vehicle....our guys have set off to verify this and we hope to celebrate good news tonight. Ever optimistic, we are organizing a secure parking place for the vehicles so we can check on the mechanics before we set off. We need to fill water tanks, petrol tanks, check batteries, get fridges working... Today we will purchase our meat from a local supermarket so we can begin freezing it in our hotel deepfreeze. The Arcade has really become like home. We are all up bright and bushy tailed this morning as this is D Day. The vehicles will be delivered to the container yard. We leap into taxis and follow Allin our contact to the depot. We spend four hours in a hot stuffy entrance hall while Juno and Slowie are taken to redo already done papers in town again. Then an apparition appears before us as three gigantic trucks arrive carrying our babies. A gigantic piece of machinery, looking like a huge lobster offloads the containers and we stand in blazing sun for another three hours while each container is prized open by sweating chaps with our guys doing their bit too. Slowly the cars appear like moths out of protected cocoons: They have been secured so expertly by Juno and his crew that not even a glass is broken: Thank you Juno and all concerned. We rush to our cars and hug them. Allin beams at his achievement and our grins are even broader. "WE HAVE OUR OWN WHEELS AFTER almost two months". We have been in Douala for 11 days and are sure that we could take tours here at this stage. Our cars look professional - decorated professionally with the badges of all the countries we have previously visited and those we will travel through on this expedition from Camerooon to Morocco. We form a close convoy and weave through Douala towards our hotel. 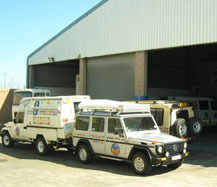 Now we can check the vehicles thoroughly to see if they travelled well and begin to pack in our extra items. Fridges are immediately turned onto "freeze" ready for our already frozen eats etc. Our hearts begin to beat that special African rhythm one can only experience when your feet are touching the sands of the African continent. a week ago! Southern Cameroun is very tropical and we were able to buy many fruits alongside the roads...bananas, pawpaws, avocados, pineapples, and oranges. We arrived in Ngaoundere today and booked into the TransCam Hotel for 2 nights. This is a sizeable city in Northern Cameroun. We have covered 1 400 KM in 8 days averaging 33 KM an hour. The journey has been very difficult. 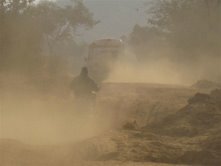 Our vehicles grind along sending up huge clouds of red powdery dust forcing us to travel up to 300 meters apart. We have been told that the roads will improve as we travel towards Nigeria. So far the roads have been a combination of potholes, ruts, trenches and rollar coaster sections changing to the occasional smooth gravel road. 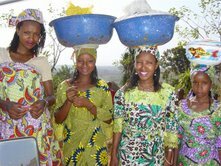 Northern Cameroun is predominently Muslim with the men wearing flowing robes and women draped in colourful fabric. 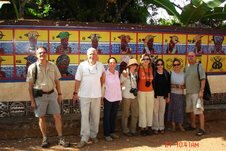 We have found the Camerounian people friendly and helpful. 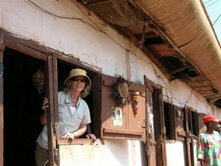 They live in mud houses with thatched roofs and their concrete houses all seem in great need of repair. We see many decaying grand buildings left from the colonial era and they are all in a sad state of disrepair. 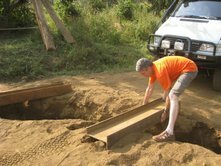 Maintanance is never a strong point here in Africa. Despite this, everyone seems content. 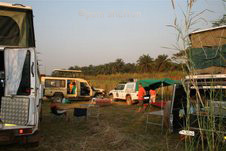 Once we left Douala we have bush camped every night. This to us is the best way to travel through Africa. Our first night of bush camping was at Centre de Climatique, a rundown hotel today, but in the past it was a prime German tourist destination. We set up camp on the lawn with a lovely view of the town below. 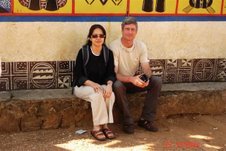 The next night, Christmas Eve, we spent at the camping site at the Bamenda Presbyterian Church. The girls all cooked a tasty dish to share, we lit red candles, invited a French couple who were traveling on their own to join us, sang Christmas carols and experienced a Christmas never to be forgotten. 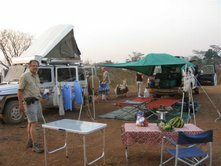 After that,we drove off the road and simply set up camp in the bush. We fill up our water tanks in villages at water pumps operated with a foot pedal by little children who are so willing to pump for us. A lollipop at the end of the chore brings big smiles to their little faces. All were repaired. The Camel and Max are behaving perfectly. Yesterday, a heavy truck destroyed a log bridge resulting in a traffic jam. 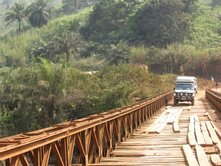 The ingenuity of the locals was outstanding when they constructed a new bridge using wood from a nearby village, cut to size with a chain saw and tied together with chains nailed into the wood. This engineering feat took one and a half hours to complete and we were back on the road again. Every day, we pass happenings that call for photos. Motorbikes whizz over sandy roads at high speeds with no problem carrying up to 4 passengers each, and we witnessed one carrying 2 goats between 2 passengers. Cars bat along at full speed without shocks loaded with people and goods. Big trucks trundle along throwing up storms of dust over our vehicles. We visited the Royal Sultan's Palace built in 1917 and we were privileged to see him greeting his people from his Palace doorway. The Palace Museum was filled with artifacts such as jewellery, swords, war weapons, clothing, masks and other memorabilia. 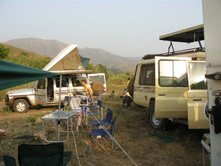 The highlight of every day in Africa though, is the sense of serenity and peace we feel as we set up our camp, have a shower and sit down to sip a whiskey or local SSS beer. The sun sinks deep beyond the horizon and we know why we love Africa so much. 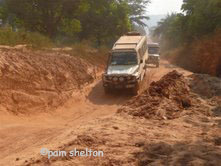 The next leg of the journey takes us to Wasa National Park in Northern Cameroun and then heading to Nigeria.